[/symple_box]Moving Ahead Services offers a household kit for homes of 3000 square feet or more. The 3000+ sq. ft. household kit offers everything you could possibly need to pack up a home of such a large size. 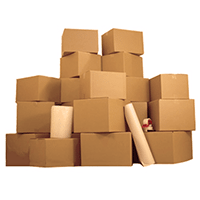 This particular kit includes 80 small boxes, 80 medium boxes, 20 dish barrel boxes, 30 large boxes, 15 extra large boxes, 12 24” grand wardrobe boxes, 30 rolls of tape that are 55 yards each, and four 25 pound rolls of packing paper to give you a total of 100 pounds of packing paper. Each box is built from thick cardboard that will stand strong against outside forces, whether they experience any wetness or contact with other objects. 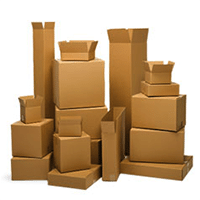 The small and medium boxes will accommodate a broad variety of objects, such as toiletries, office supplies, and electronics, while the large and extra large boxes can fit small appliances, pillows, blankets, or anything bulkier. The dish barrel boxes offer protection for your dishes or any chinaware you may have and the grand wardrobe boxes will contain your clothing. Meanwhile, the tape and packing paper are intended to provide secure cushioning for your belongings. By purchasing a kit, you are guaranteeing yourself enough supplies to pack up your entire home in a safe and secure manner, also saving a lot of time and money that would otherwise be spent acquiring individual portions of supplies. Having such a large space to pack can be a very daunting prospect, but you will likely find yourself less stressed out over the situation by taking advantage of our kit. 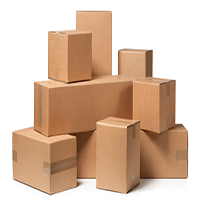 You will be the talk of the neighborhood when everyone sees so many boxes arriving to your home, so order our deluxe household kit so that you can move out with a bang.